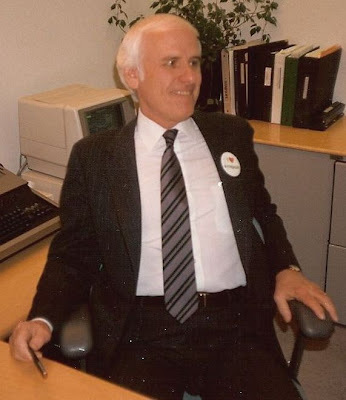 Above: The late Jim Rohn at the Herbalife Headquarters, Los Angeles, California, January 24, 1988. Picture taken by Paul Hopfensperger. On December 05, 2009, my mentor of 22 years, Jim Rohn (http://tribute.jimrohn.com/) very sadly passed from this world into the next. He had such a profound effect on my life, it is impossible to put into words. He taught me the ability to believe that anything you want in life is possible, you just need to do whatever it takes to achieve your goals and he was most definitely there in my mind through both of my channel swims. Of all the incredible things he taught me, one little phrase always sticks in my mind. A phrase which some people I have said it to, just look back at me blankly, while with others it instantly strikes home and fires them into action. The phrase was “Things don’t just happen. Things happen just”. I will let you decide if that simple phrase makes sense to you, however, in my humble opinion, it is most definitely appropriate for the story I am about to tell. God rest you Jim, and thank you for getting me to where I am today. The following story was inspired by Jim Rohn who taught me to set goals and to never give up on a dream. Having handed back my BLDSA trophies to the president on Saturday September 27, 2009, my wife Beccy, son Luca and I headed the extra few miles from Lynn Regis to Hunstanton in North Norfolk. Why? I wanted to swim 'The Wash' in 2010 and set about trying to organise the swim. Above: Me with Hunstanton Beach Patrol Officer, Ken Sach holding the Mercedes Gleitze plaque to commemorate the 75th anniversary of her swimming The Wash.
Ken informed me that the plaque had never been erected due to Mercedes Gleitze's name being spelt wrong, they spelt it 'Gleitz' instead of 'Gleitze'. He also informed me that he had a large collection of her memorabilia. To cut a long story short, this episode started me on a journey which has been unbelievable so far! Above: An autographed photograph of Mercedes Gleitze (b. 1900 - d. 1981) the first person to swim The Wash and the first British Lady to swim The English Channel. Ken gave me a lot of information about The Wash and some very useful contact numbers of people in North Norfolk who can help with my proposed swim. Above: The Wash, Saturday September 27, 2009 at low tide. The other side can just about be seen if you look closely. Returning home, I was very inspired to find out more about The Wash and to start organising my swim. But who would be the pilot?, who would ratify the swim?, etc., etc. There were so many questions with no answers, but I had an idea. About a year earlier, I had spoken to two illustrious Open Water Swimmers about this very issue, and it was clear that there was a need for an organisation to help swimmers achieve their goals in open water swimming, where an existing organisation didn't exist. And so, on October 25, 2009 we formed International Open Water Swimming Association Limited (IOWSA) for this very purpose. We already have members in the USA, UK, Ireland and Malta, and we have only just started. At present, my swim of The Wash will be the first IOWSA swim, and it is very exciting! We have registered "King of The Wash" and "Queen of The Wash" as IOWSA trademarks and if anyone wants to swim The Wash, contact us through the IOWSA website (http://www.iowsa.com/). Anyway, back to the story. 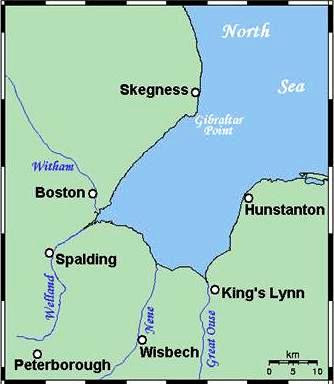 While collating and ratifying the known swims of The Wash, I spoke to both Kevin Murphy and Mike Read, who have both swum The Wash, with Mike Read being the last person known to have swum it back in 1976. He told me that there was originally a trophy, which he had won in 1976 and which he hasn't seen for years. He told me to contact East Lindsey District Council as they were the ones who took it from him. I telephoned them in early November and spoke to a lady called Jackie. I told her about the trophy and she said she would investigate. About a week later she phoned me back and said there was no luck. She had tried everything but to no avail, no one had heard of it. I thanked her and wondered how I was going to locate the trophy. About an hour later, I had a very excited Jackie on the phone - "We've found it!" she yelled excitedly. "It was in an old warehouse in a box. It's a bit dirty but should clean up OK. What do you want me to do with it?" she asked. I suggested donating it to IOWSA if no one wanted it, and we could use it for swims of The Wash. She spoke to her superiors who agreed. Yesterday, after a 165 mile drive in the snow, I drove to in Manby, Licolnshire in my role as Chairman of IOWSA, where I met Jackie and she gave me the trophy. She was so pleased and said of all the things she had done since being on the council, this was the most satisfying. Apparently, she tried everyone she possibly could to locate this trophy, and spent all of yesterday morning cleaning it up before handing it over to me. Above: Jacqueline Thomas of East Lindsey District Council hands over the trophy to Paul Hopfensperger, Chairman of the International Open Water Swimming Association in Manby, Licolnshire on Wednesday December 16, 2009. Kevin Murphy - Age 24 - 26th May 1973, 13 Hrs. 54 Mins. Tina Spry - Age 13 - 26th May 1974, 8 Hrs. 36 Mins. Michael Read - 1974, 7 Hrs. 52 Mins. Michael Read - 1975, 8 Hrs. 30 Mins. Michael Read - 1976, 5 Hrs. 57 Mins. This is an historic trophy, and I am honured to have accepted it on behalf of IOWSA, and am looking forward to The Wash being the inaugural swim organised by IOWSA in 2010, followed by others overseas. I would sincerely like to thank Jacqueline Thomas from East Lindsey District Council (ELDC) for her persistance in trying and evetually succeeding in locating this trophy and to James Gilbert also from ELDC for allowing IOWSA to have the trophy and organising yesterday's visit. I would also like to thank Ken Sach of the Borough Council of Kings Lynn and West Norfolk for donating the Mercedes Gleitze memorabilia to IOWSA. So from a tiny seed planted in my mind by Kevin Murphy in July 2007, all of the above has happened. As Jim Rohn said "Things don't just happen. Things happen Just".